Food is more than a meal. It is a memory-marker. Certain dishes, no matter where I eat them, remind me of the place they became familiar, or the person who shared them. This recipe is from a precious month spent with my friend Wendy. She had just been transferred to Galway from Shanghai; I’d fled Glasgow after a miserable year of grad school. Her fiancé was working in another city; my flatmate was moving to Morocco. When Wendy invited me to stay with her in Ireland it made sense – yet I hesitated. We hadn’t lived in the same country for over four years, or in the same flat, ever. Despite my fear that our once supple friendship might have stiffened with time, I went. It was the best decision I ever made. The rainy October evenings we spent together were some of the happiest I’ve known and nothing evokes them like a pot of Chinese-style mushroom soup. We’d work side by side. Wendy would wash the greens, one leaf at a time, while I hacked at the onions, tears running down my face. I’d overheat the pan and scorch the garlic; her mushroom slices would line up in even, unhurried rows. 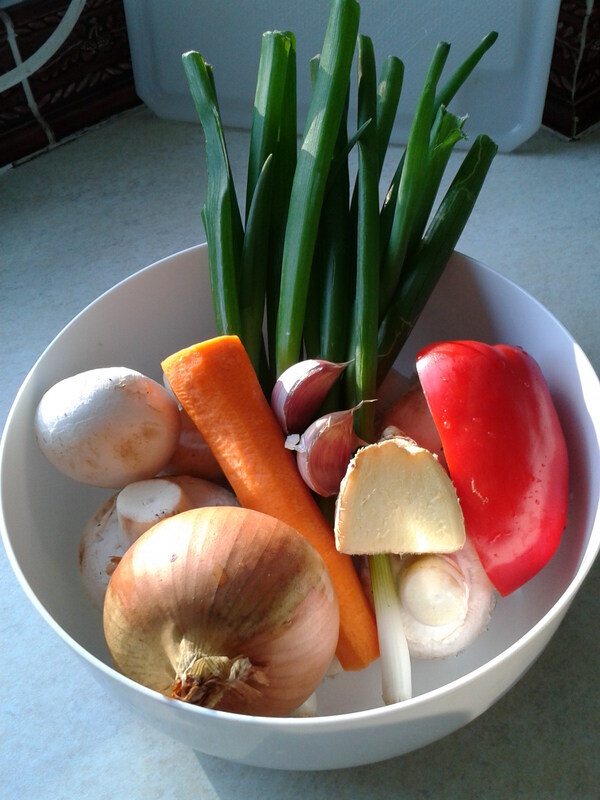 The core ingredients are onion, garlic, fresh ginger, mushrooms, noodles and greens but our soups varied. 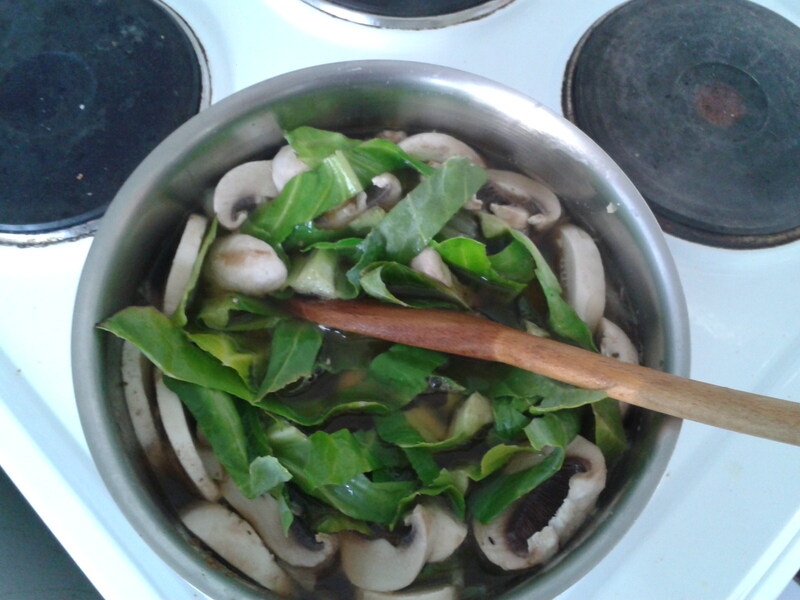 The mushrooms might be white, chestnut, Portobello or oyster; the greens savoy cabbage, kale or spring greens. Sometimes we’d add carrots, sugar snap peas, spring onions, bell peppers or green beans. When it was ready, we’d split it for final modifications. A vegetarian, I would add cashew nuts, fresh chilli or tofu. Wendy, an omnivore, liked broiled salmon or prawns. We’d splash on soy sauce and top with fresh parsley. Its versatility makes this a perfect dish for sharing, cupboard-clearing or getting through the week before payday. 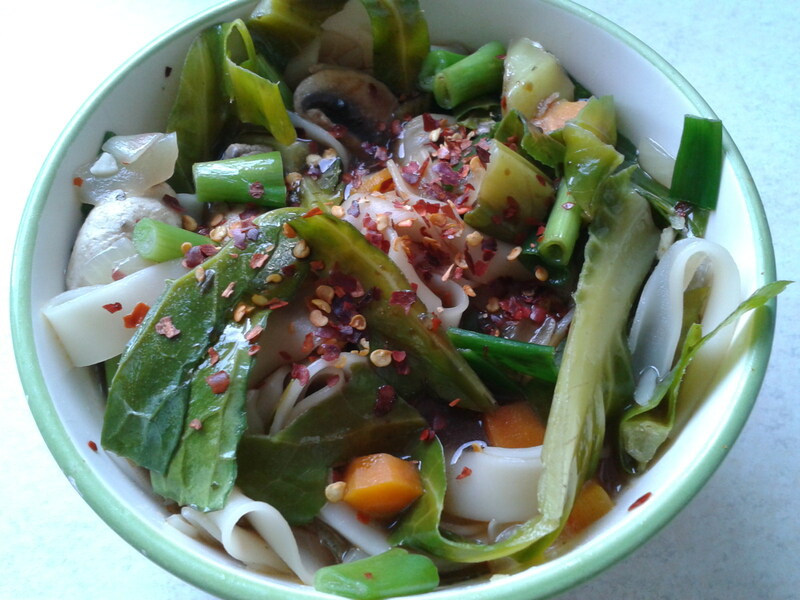 We found that even a modest quantity of vegetables multiples in a pot of stock – though light-flavoured and low-calorie this is a remarkably satisfying meal. Serve in large, shallow bowls. Garnish with additional chilli, soy sauce, parsley or other toppings as desired. If you have an interest in writing a guest blog for The Rantings of an Amateur Chef, please let me know at rantingchef@yahoo.com. wow … interesting!!! gotta give this one a go this weekend!!! Thanks for sharing! Will definitely be trying this one when it isn’t so hot outside. I just can’t do soup when it’s 106 outside! I’m not a mushroom fan, but the combination of everything sounds delicious!!! Well, with my “Mushroom Madness” condition—I’ll try this one for sure. Looks fantastic. I generally avoid vegan stuff because of all the soy they use, but this sounds really good!